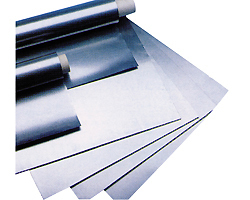 Flexible graphite sheet is made with pure expanded mineral graphite. Our flexible graphite sheet has a high purity of 99% carbon content. Higher carbon content gives the flexible graphite better chemical resistance, better thermal conductivity, and better sealability. As gasket material, it is usually fabricated into Graphite Laminate, reinforced graphite sheet and widely used in fluid sealing applications: flange gasket, spiral wound gasket, heat exchanger gasket, etc. It can also be used as solid lubricant in metal stamping and forming applications, or as heat liner in industry furnaces and other heating devices.